After going to Shuin, Beloved and I had dessert at Cheesecake Etc. 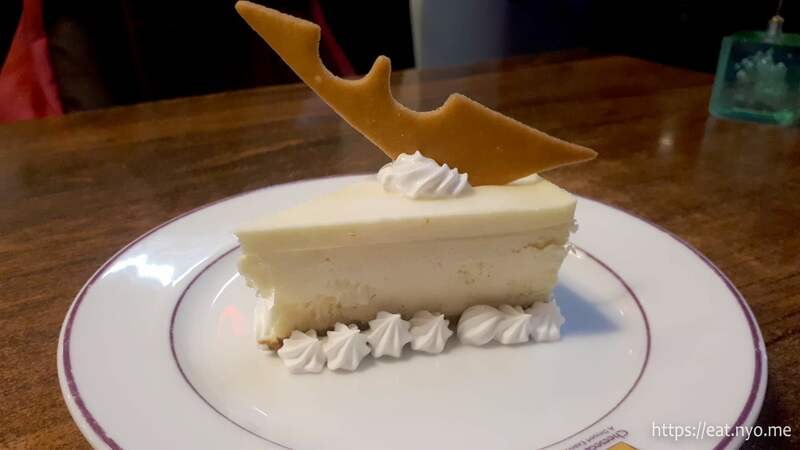 Located right across the aforementioned place, Beloved already did some research and managed to convince me to try it since one of their cheesecakes sounded interesting. 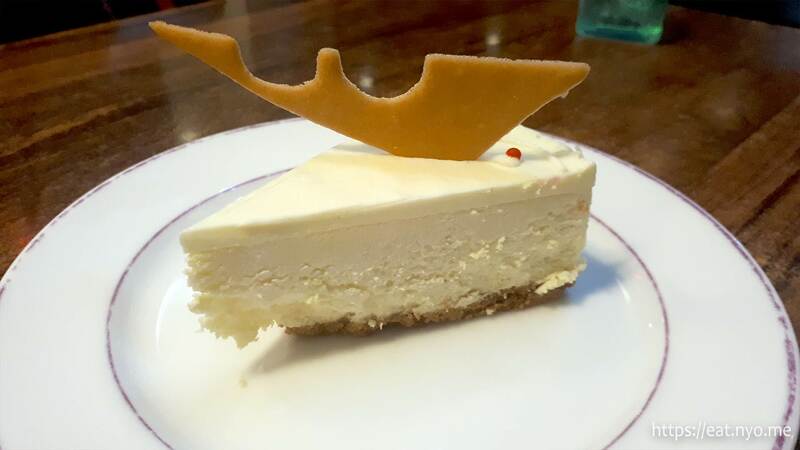 Oh, and this place serves cheesecakes. Surprising, eh? Although we already know what kind of cheesecakes they serve, we were surprised to learn that they serve Tully’s coffee. Beloved ordered a slice of their Belgian Double Cream (150 Php) and I got their Sugar Free New York Cheesecake (180 Php). 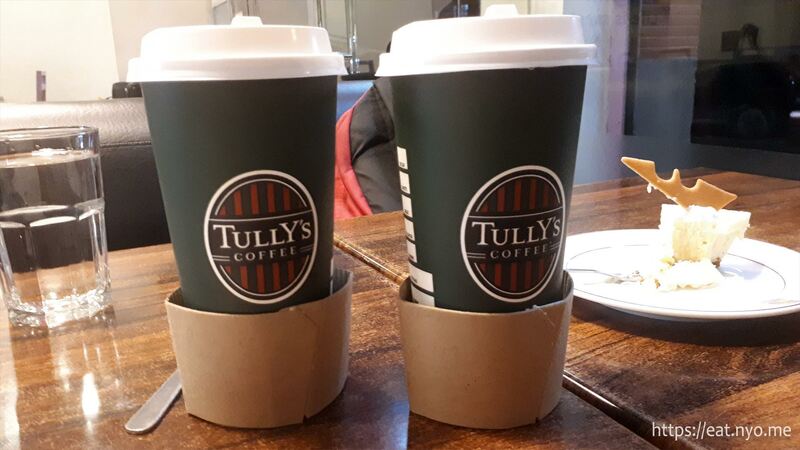 Also, we both got a large order of their Tully’s coffees; Americano (130 Php) for me and Mocha (160 Php) for Beloved. Our orders looked very similar. My Sugar Free New York Cheesecake barely had any crust below. It had a gelatinous layer over an almost chiffon-like cake. I’m saying chiffon-like because it has the consistency of your usual cake with the crumbly parts, yet still a bit thicker than usual. It barely tasted like cheesecake, both the gelatinous part and the chiffon part. Heck, it barely tasted like anything at all. The most tasty part of this cake was the semi-sweet biscuit on top. Visually, Beloved’s Belgian Double Cream had some icing on the top and side. It even has the same biscuit, which was also the tastiest part of this cake. Taste-wise, it’s just a tad bit sweeter, but otherwise still forgettable. I actually liked their take on Tully’s coffee. My Americano tasted a lot like Costa coffee, with a mostly roasty-bitter taste and almost no acidity, very unlike what I had in Japan. Beloved describes her Mocha as “Moo with coffee”. For the uninformed, “Moo” is basically a chocolate-milk drink popular here in the Philippines for children. It’s much more milkier than the usual mochas we’ve been accustomed to. 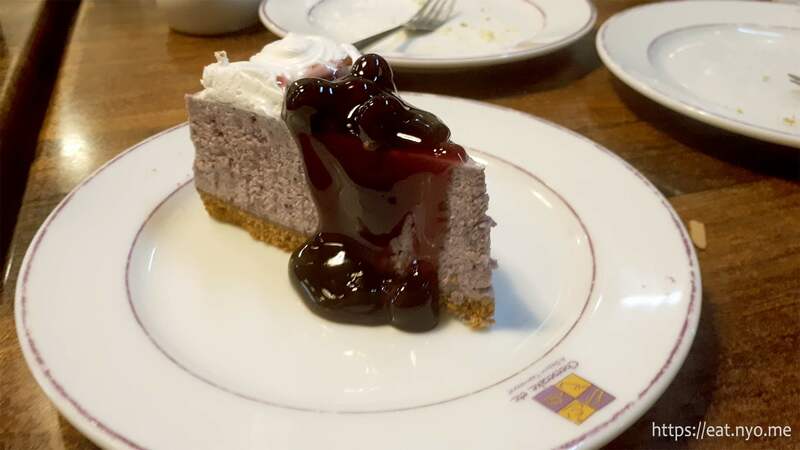 Because I know we won’t try this place again, I convinced Beloved that we order their Blueberry Cheesecake (180 Php). This one didn’t have the gelatinous layer and instead was just the chiffon-like layer in blueberry color but not-as-much blueberry flavor. Most of the sweetness came from the preserved blueberry toppings, which wasn’t anything special. Well, at least this one has an entire layer of the pie crust intact. Unfortunately, we had very different expectations for cheesecake over what we got. What we had was mostly cake, with very little semblance of “cheese”. For me, cheesecake should technically be called cheese pie, since that’s what it is—a pie crust filled with a cheese-like substance. What Cheesecake Etc. served us were mostly cakes and barely pies. Sadly, I found the “cheese” part lacking a lot. While, I did like the coffee here, unfortunately, I cannot recommend the cheesecakes in Cheesecake Etc.. Recommended for: Dark roast coffee lovers. Smart nomnomnom tip: Skip the (cheese)cakes, just try the etc.